Her association with fertility allows her to be described as the mother of many children and that barren women would visit the shrine. Due to the dispora from Nigeria travelling across the world the deity is recognised globally often associated with the Virgin Mary as in Cuba manifesting itself with their patron saint. Therefore pilgrims come from as far as Peru, USA, Brazil, Germany and the UK. “A century ago there were many sacred groves in Yorubaland: every town had one. Most of these groves have now been abandoned or have shrunk to quite small areas. Osun-Osogbo, in the heart of Osogbo, the capital of Osun State, founded some 400 years ago in southwest Nigeria, at a distance of 250 km from Lagos is the largest sacred grove to have survived and one that is still revered. The dense forest of the Osun Sacred Grove is some of the last remnants of primary high forest in southern Nigeria. Through the forest meanders the river Osun, the spiritual abode of the river goddess Osun. Set within the forest sanctuary are forty shrines, sculptures and art works erected in honour of Osun and other Yoruba deities, many created in the past forty years, two palaces, five sacred places and nine worship points strung along the river banks with designated priests and priestesses. The new art installed in the grove has also differentiated it from other groves: Osogbo is now unique in having a large component of 20th century sculpture created to reinforce the links between people and the Yoruba pantheon, and the way in which Yoruba towns linked their establishment and growth to the spirits of the forest. The shrine and its waters is therefore still an important site indicating the importance of Sacred pre-Christian waters to the modern often Catholic African and South American population. It was probable that originally the shrine demands a real watery sacrifice at times and that the association with August conveniently near the feast of Mary allowed a more convenient personal sacrifice to be given. Today despite slight modernisations it is a powerful place of faith. Thus, it was simply as a natural wonder that writers from Humphrey Llwyd to Pennant chose to describe Ffynnon Leinw; but attitudes were beginning to change, and interests slowly to widen. In 1613 Michael Drayton (1563-1631) published the first eighteen sections (of an eventual thirty) of his epic poem Poly-Olbion, or a Chorographicall Description of all the Tracts, Rivers, Mountains, Forests, and other Parts … of Great Britaine. Mapping England and Wales with reference to their noted springs and rivers, he used this imagined framework to relate the history, real and legendary, of the two countries. In the course of this (Tenth Song, lines 132-40) he versified Humphrey Llwyd’s Commentarioli passage on the Cilcain well. Of all the Cambrian Springs of such especial grace [&c] (Hooper 1876, II, 49-50). At the end of each Song Drayton’s friend the jurist and antiquarian John Selden (1584-1654) supplied detailed references and commentaries for the various locations, sights and wonders celebrated in the Poly-Olbion. For lines 132-8 Selden identified the well as Finon Leinw in Kilken, and referenced the accounts of Llwyd and Powel; and he further noticed the ebbing-and-flowing wells at Newton (from Stradling’s account in Camden) and Dinefwr (from Giraldus). But when he came to account for the ebbing-and-flowing phenomenon itself, he seemed to suggest – doubtless, tongue-in-cheek – that such wonders existed simply to tease the antiquarians. Nor think I any reasons more difficult to be given, than those which are most specially hidden, and most frequently strange in particular qualities of Floods, Wells, and Springs; in which (before all other) Nature seems as if she had, for man’s wonder, affected a not intelligible variety, so different, so remote from conceit of most piercing wits; and such unlooked-for operations both of their first and second qualities (to use the School phrase of them) are in every Chronographer, Naturalist, and Historian (ib. 59). Without a trace of humour, the “experimental philosopher” Robert Hooke, in his Micrographia of 1665, aimed to remove the very idea of certain springs as wonders altogether. The same Spring may be fed and supplyed by divers Caverns, coming from very far distant parts of the Sea, so as that in one place be high, in another low water; and so by that means the Spring may be equally supply’d at all times. Or else the Cavern may be so straight and narrow, that the water not having so ready and free passage through it, cannot upon so short and quick mutations of pressure, be able to produce any sensible effect at such distance. Besides that, to confirm this hypothesis, there are many Examples found in Natural Historians, of Springs that do ebb and flow like the Sea: As particularly, those recorded by the Learned Camden, and after him by Speed, to be found in this Island: One of which, they relate to be on the Top of a Mountain, by the small Village Kilken in Flintshire … Which at certain times riseth and falleth after the manner of the Sea. A Second in Caermardenshire … (ut scribit Giraldus) … The Phaenomena of which two may be easily made out, by supposing the Cavern, by which they are fed, to arise from the bottom of the next Sea (Hooke 1667, 27). Would Truth dispense, we could be content, with Plato, that knowledge were but remembrance; that intellectual acquisition were but reminiscential evocation, and new Impressions but the colourishing of old stamps which stood pale in the soul before. For what is worse, knowledge is made by oblivion, and to purchase a clear and warrantable body of Truth, we must forget and part with much we know (ib. 227). It is interesting, not to say salutary, to recognise how very few of the learned people who wrote about Ffynnon Leinw had ever seen the well. That had probably been necessary for it to retain its natural wonder reputation; the end of the natural wonder age with the triumph of the age of the Vulgar Errors allowed other aspects of Ffynnon Leinw’s history to be brought to the fore, and a new model to be proposed – one rather closer, it may be, to the actual facts, and certainly one more in keeping with the dawning Gothick and Romantick sensibilities of the eighteenth and early nineteenth centuries: Ffynnon Leinw comes belatedly to be understood as a holy well. This year I will finish my book on Holy Wells and Healing Springs of Warwickshire a county which has been surprisingly rich in fascinating sites and last summer I had the pleasure of doing a field trip with fellow wellie and member of the Holy wells and sacred springs of Britain Facebook Group and admin of the Holy, ancient and roadside wells of Warwickshire group Steve Bladon as we explored a number of sites around Rugby. 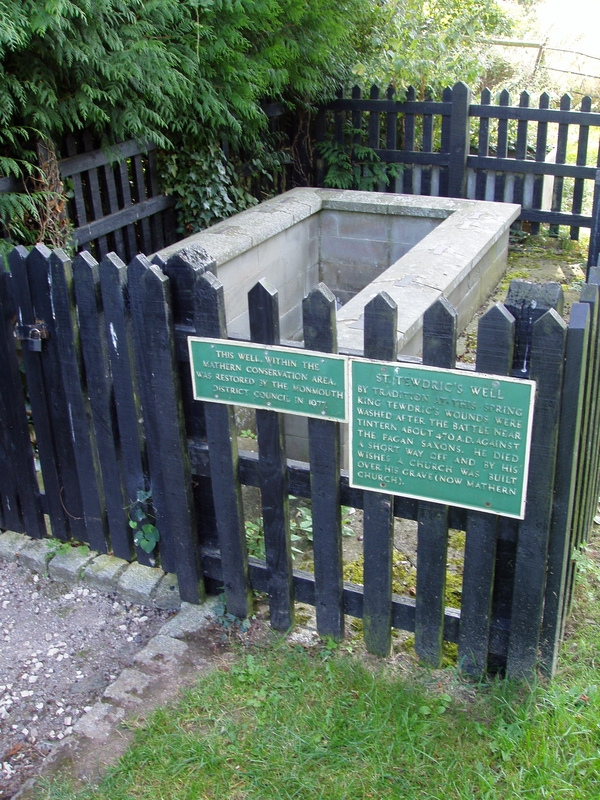 Perhaps one of the most unusual wells is found at Watergall Bridge on the outskirts of the parish is the Monk’s Well (SP 418 548). 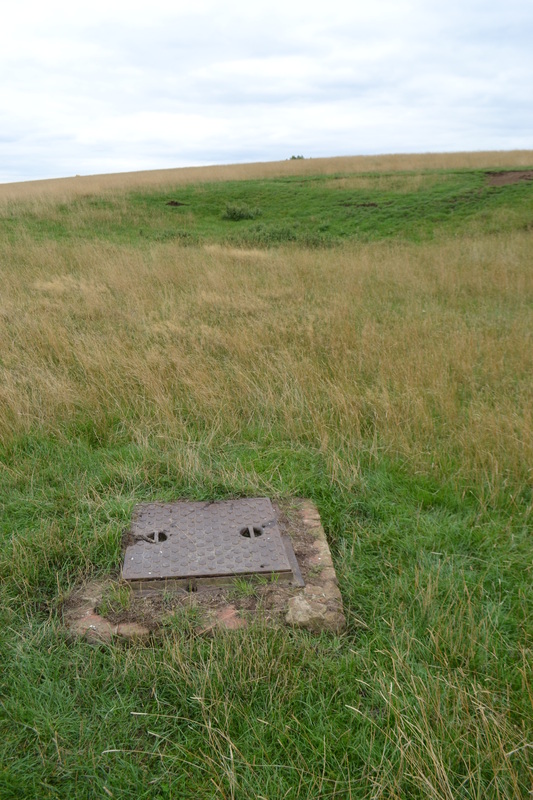 The Monk’s Well is not marked on the map as such but its location can be surmised by the presence of a blue W above an old farm house off the A423 road. A footpath went from the road, past an old farm house and directly to the well or rather veered a little to the left but close enough to have a quick look anyway. However when we arrived there, there was no sign of a path beyond the gate. As we pondered map in hand our next move, the farmer appeared. He was curious of what we wishing to do but as soon as he learnt we were interested in the well he became very welcoming and told us about the history of his house which appeared to have been once a manor house with the remains of the walls of a very large garden being visible to the side of the house. The farmer gave us permission to explore the well; he added that he used to go down into it when he was a teenager but hadn’t looked inside for years. He knew of the legend an unusual one, and one I had not read associated with any British holy well. Climbing the hill where the spring was marked on the map in blue lettering the first significant site we encountered was the large conduit house. 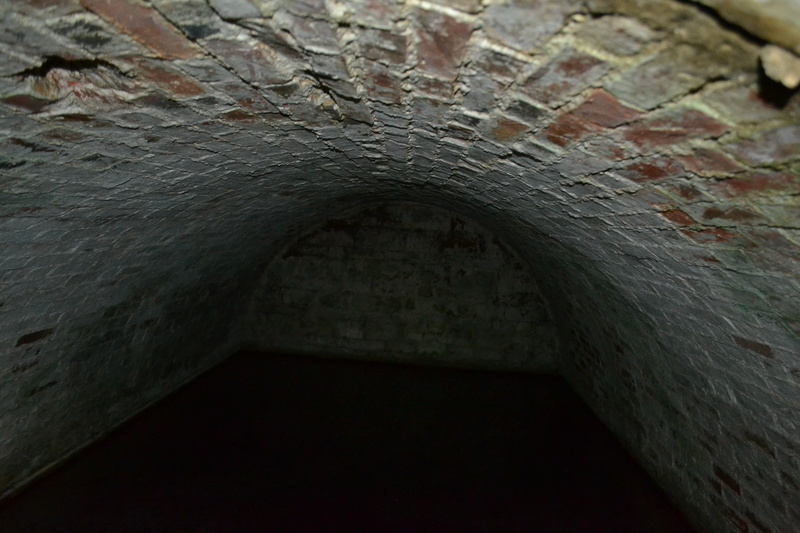 This is a substantial brick building, an arch approximately eight metres in diameter over a large rectangular pool of clear water, 14 by 25 metres. Originally the date 1618 was over the arch but this has now been lost. It is a substantial structure. Climbing further up to the site of a well one is greeted by a modern metal drain cover. Not very promising. But carefully lifting it a shaft can be seen. 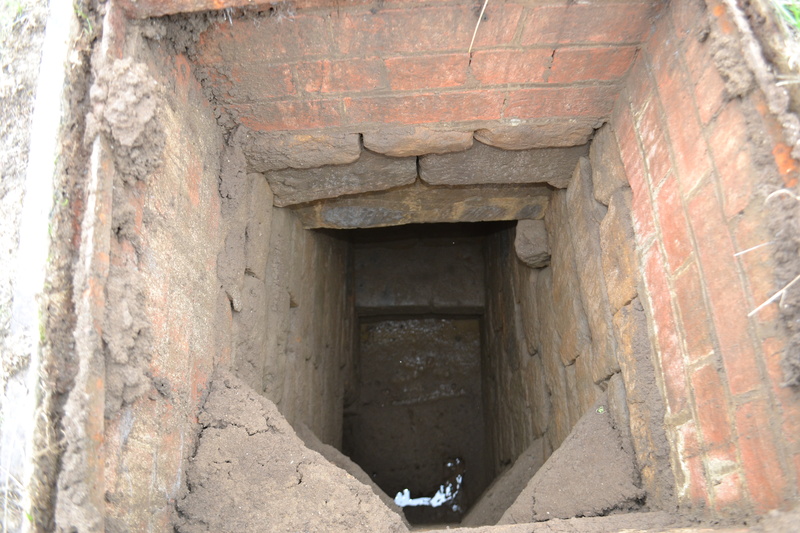 This shaft itself is remarkably well made being made of dressed stone with stones projecting out allowing someone to climb down into the well, the spring of which appears to arise around two metres into the ground. 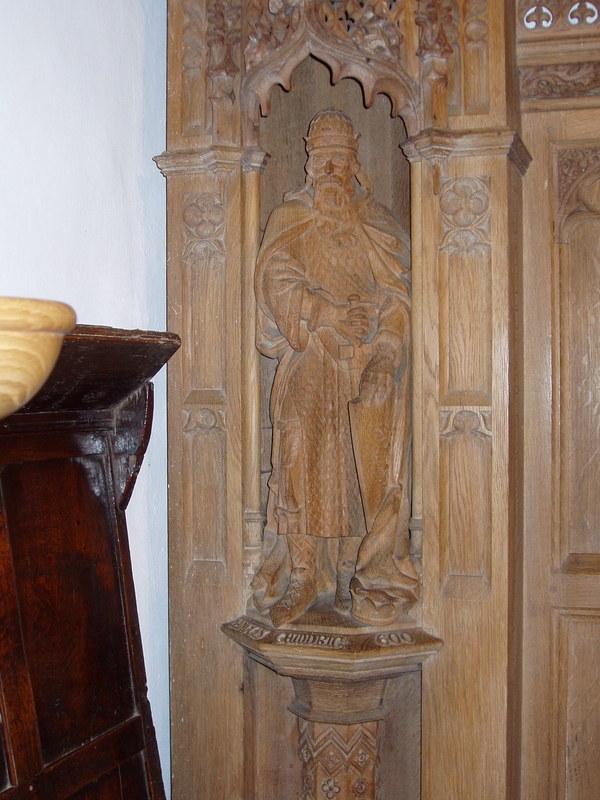 As stated the seat if on interest for an oral tradition records that the monks inhabited the nearby manor house and were sent down into the well as a form of penance explaining the seat. An unusual form of penance but in line with other traditions perhaps of immurement. Evidence for the tradition that transgressing monks were somehow incarcerated in walls is scant however a discovery of a skeleton found with a book and candle behind a wall in Thorney Abbey Lincolnshire may well record it. However, was there ever a religious community at the site? The only scant evidence is that records show that early in the 13th century Henry son of William Boscher gave to the monks of Combe Abbey land on Heidune for building a new mill, and a little later John de Lodbroke gave 3 acres ‘below the mill’, this being evidently a windmill It is also recorded that on 14 February, 1227, the prior and monks of Coventry were granted in perpetuity a weekly market on Wednesdays at their manor of Southam (Suham) and a yearly fair at Coventry on the feast of St. Leger and the seven following days. However, this does not suggest there was any property here. A tradition records that they may have had a grange there. The local legend was known by the owner of the land but he believes there was never a religious house here the land being owned by the Spencers in medieval times. But it seems unlikely they had enough monks that would need such a bespoke penance. Whatever the truth it is the most unusual of sites in the county and perhaps the oddest legend in the country. Interesting in an area noted once for a large lake, hence the name Watergall, gall deriving from an Old English word for watery, it is not alone. Before the farm near the road is a mineral spring of which is noted by the owner of the farm that there were plans to develop it into a spa in the 1920s with full details being published locally but I have yet to find them. It arises in dilapidated wooden shed in a rectangular basin. Iron chalybeate water can be seen but the flow is sluggish. On the Yucatan peninsula, the limestone worn by millennia of the elements has created remarkable sink holes or cenotes that at Chichen Itza is known as the Cenote Sagrada, the sacred cenote or more disturbingly the Well of Sacrifice; an eerie and mysterious place but how true is it? Local tradition both Mayan and Spanish claim that before the Spanish settlements the Maya would sacrifice objects and human beings to placate Chaac the rain god. Ever keen to reveal the truth it was Edward Herbert Thompson who between 1904 to 1910 decided to dredge the bottom and revealed some interesting objects. Thompson was working through unstable times during the Mexican revolution and understandably perhaps some of the objects went missing before they were catalogued. His house was also burnt down during his time there consequently resulting in him losing notes. Thompson is said to have bought the site and used a pulley system with a bucket. Although much of the early work involved clearing debris such as trees which hampered the procedure. The buckets would be removed and local people sifted through the water to find artefacts and categorise them accordingly. These objects according to Clemency Chase Coggins 1984 Cenote of Sacrifice: Maya Treasures from the Sacred Well at Chichen Itz were obsidian, wood, shells, bone cloth, rubber, pottery an flints as well as gold, jadeite, copal. Some of these materials were not native to the Yucatan peninsular suggesting that perhaps pilgrimages were made to the site and that it was an important cultural centre. Was there also evidence that some of the materials were purposely damaged before being thrown into it a common activity throughout the world to ‘kill’ the object before sacrificing it. What is interesting is the organic matter which was remarkably preserved particularly the wooden ones which indicated what weapons they sacrificed. Other excavations were subsequently less successful, the Instituto Nacional de Antropologia e Historia (INAH) director William Folan in 1961 did find wooden ear flares with jade and turquoise mosac, a large chert knife, a gold sheathed bone with a wooden handle. The subsequent exploration of Norman Scott and Roman Pina-Chan in 1967-8 tried emptying the cenote and trying to clear the water. However, only 13 feet or so of water could be removed and it did not really clear. What about the human sacrifice? On the Tuesday of Holy Week 1188 Giraldus and Archbishop Baldwin rode from Bangor to Rhuddlan Castle, where they were entertained for the night. On Wednesday Baldwin preached the Crusade in Rhuddlan, before saying Mass in St Asaph cathedral, after which his party rode on to spend the night at Basingwerk Abbey, near Holywell. On the Thursday they rode to Chester. At some point (Giraldus’ mention is made between his accounts of Tuesday evening and the events of Wednesday, so that he probably heard it at Rhuddlan on Tuesday night) they were told of a spring not far from Rhuddlan which ebbed and flowed twice daily with the tides, but which was also liable to rise and fall frequently throughout the day. Humphrey Llwyd identified Giraldus’ unnamed spring with an unnamed ebbing-and-flowing well in Cilcain parish; adding that the spring was observed to dry up at a certain time of the year. 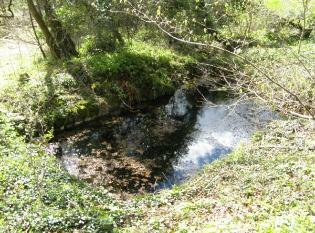 Llwyd’s identification of Giraldus’ spring with the Cilcain well was followed by David Powel, who named the latter as Ffynnon Leinw; and Camden followed Powel in locating an ebbing-and-flowing spring in the parish of Cilcain, without naming it. Richard Mostyn and, after him, Edward Lhwyd, suggested that Ffynnon Asa, in Cwm parish, as being closer to Rhuddlan, was a more plausible match for Giraldus’ spring; also noting that Ffynnon Leinw no longer ebbed and flowed. Giraldus’ topographical notices in the Itinerarium were almost entirely anecdotal, apparently dependent upon the casual comments of his hosts; the hit-and-miss character of this kind of information-gathering can be assessed from the fact that, although he spent a night at Basingwerk, he has no account of St Winefride’s Well, Holywell, although its fame was by then long established in north-east Wales and the northern Marches – its absence is best explained by assuming that no-one happened to mention the Holywell well to Giraldus during his few brief hours at Basingwerk. Less than two miles from Rhuddlan, Ffynnon Asa is a plausible identification for Giraldus’ spring; Ffynnon Leinw, rather less so. But, given the sheer number of wells for which such claims were made, it cannot be certain that Giraldus’ spring should be identified with either Ffynnon Asa or Ffynnon Leinw. What is certain is that the ubiquity of Camden’s Britannia guaranteed that a well in Cilcain parish – more exactly identified by Powel with Ffynnon Leinw – was for centuries identified as being fed by an ebbing-and-flowing spring. So far as I am aware, the claim of regular twice-daily ebbing and flowing has never been established for any of the many springs for which the claim has been made in the past. What is probably being witnessed by such claims is a common but irregular fluctuation in water levels created by sustained periods of more or less rainfall, observed casually, from time to time, by persons who noted different water levels each time they had cause to visit the well, and invoked the example of the universal regular tidal ebbing and flowing as an explanation of a local phenomenon. In certain instances it may be that one has to do with a periodic spring, dry for part of the year, but returning after prolonged rainfall; certainly this seems to be what Humphrey Llwyd was recording for the Cilcain well. Flintshire is famous for its wells, which owe their existence to the Carboniferous Limestone that constitutes its central plain. 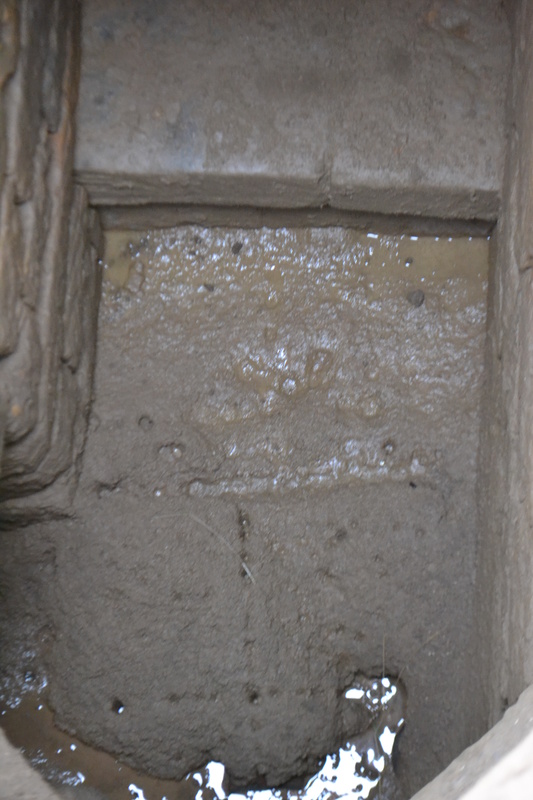 This rock is porous and the water percolates it till it comes in contact with impermeable shale or clay, where it accumulates and finds its way again to the surface through some of the many fissures … Ffynnon Leinw, “the flowing well,” in Cilcain parish, was at one time an intermittent spring, flowing at regular intervals, owing to syphon action, but it has long lost this peculiarity (Edwards 1914, 25, 27). All their rivulets dive. [It names the Alun, “underground abt 3 quarters of a mile” (it sinks at a place below Cilcain village called Hesp Alun, “the dry Alun”); the Fechlas, “underground hlf a mile it breaks forth at a place therefore call’d tarth y Dŵr” (Tardd y Dŵr, “eruption, or issue, of water”); and the Cain, “dives for hlf a mile more and so to Alen within the P’ish”.] They have severall other Rills that dive (Lhwyd 1909, 80-1). (The overflow from Ffynnon Leinw drains into the Fechlas; Tardd y Dŵr is two-thirds of a mile west of the well: SJ 175 675. Tardd y Dŵr and Ffynnon Leinw are both in the former Cilcain township of Dolfechlas.) The places of their re-emergence would all exhibit greater or lesser volumes of water, depending on the rainfall. With regard to Ffynnon Leinw, more careful observation (as suggested by Richard Mostyn and Pennant) would have cleared up the popular suggestion of any twice-daily ebbing and flowing. The form leinw cannot be explained as a noun or adjective. Most Welsh speakers would know leinw from Psalms 84.6 ‘y glaw a leinw y llynnau’ [“the rain also filleth the pools” – AV]. That was in the old translation … The Psalms use leads me to suspect that the well was originally y ffynnon a leinw ‘the well which fills’. In time the relative pronoun was omitted leaving us with y ffynnon leinw > Ffynnon Leinw (pers. comm. to TGH, 14 December 2015). The name would thus seem to reference the sudden filling of a well with the recommencement of a periodic spring after heavy rain. It would seem not to carry any inevitable sense of a regular ebbing and flowing like the sea’s tides, but only of flowing; though doubtless the secondary use of the noun llanw for “the flow of the tide” would facilitate any popular misinterpretation of such periodic springs as regularly ebbing and flowing. Anyone who regularly visits holy wells must be aware of how they can differ in appearance and atmosphere. We all know the delight of finding a hidden spring bubbling into a clear pool, tucked away in a forgotten corner of the landscape; and probably we can also all remember wells that are unloved and derelict. Those can often have a charm of their own too, perhaps being in an evocative place, or with enough remaining to suggest what the place was once like. 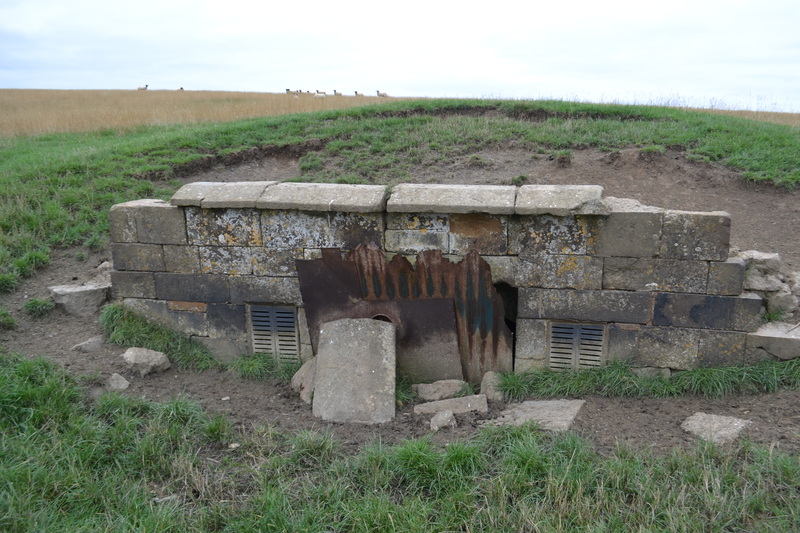 Sadly there are also wells that are in awful locations, and perhaps have also been badly restored; but luckily I can’t remember too many that come into this last category. One that does is St Tewdrig’s Well at Mathern in Monmouthshire (ST52279116), just to the south-west of Chepstow and distressingly close to the M48 motorway. 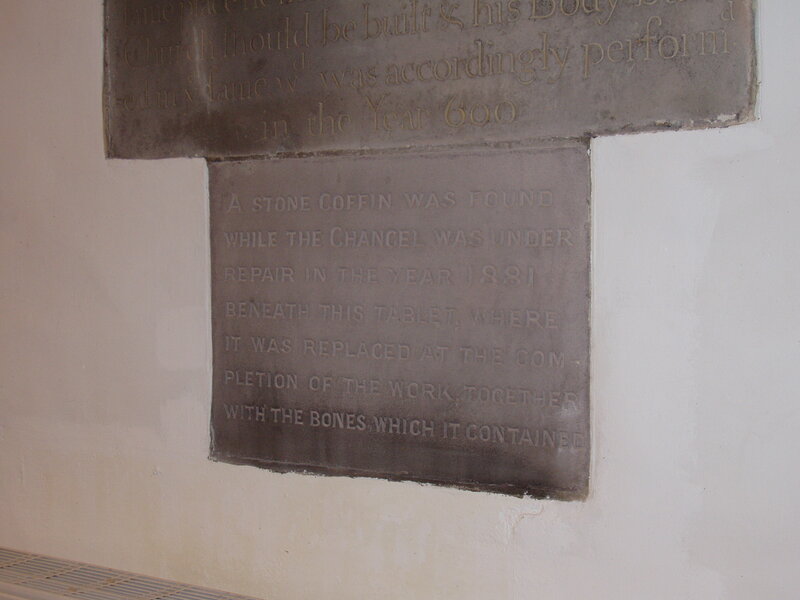 It’s a shame that the well has been so insensitively and over-thoroughly restored, because the area around the church and well has an interesting history. St Tewdrig was a king and martyr, probably born in the late 6th century. He handed over his kingdom to his son Meurig and lived as a hermit – until an angel appeared to him advising him to go and help Meurig who was in danger of being overrun by his enemies. Despite also being told by the angel that he would die, Tewdrig went to help his son, and the enemies fled on seeing the two men and their army standing on the bank of the River Wye at Tintern. Unfortunately Tewdrig was stuck by a lance thrown by a fleeing soldier, and mortally wounded. He was taken in a cart pulled by stags to a meadow near the River Severn, where a spring began to flow, and there he died and was buried. The place was given the name Merthyr Tewdrig (now Mathern) and a church was built over his grave. The name confirms that this is a genuinely ancient tradition, a ‘merthyr’ being an early Christian martyr’s burial place. The well named for St Tewdrig is to be seen beside the lane just north of Mathern church, immediately south of the motorway. There seems to be no record as to what it looked like before being restored by the Monmouth District Council in 1977. Although they are to be thanked for ensuring the well wasn’t lost, it’s a pity that they decided on this earnest municipal restoration that is completely lacking in atmosphere. With its steep steps leading down between walls to the well below, it puts one in mind of a drinking water well, rather than a place where a saintly king died over a thousand years ago. But… it is impossible to be absolutely sure if this really was the spring which flowed where he died, because I have found no mention of it before 1847, at which time it was called Ffynnon Gor Teyrn. This name may possibly derive from the Welsh word cateyrn, meaning a ‘battle-king’, and is all the evidence we currently have that might confirm this as the saint’s well. But it is very close to the church, and all the evidence we have does suggest that this is indeed St Tewdrig’s well. Those who are well versed in the subject of holy wells will be aware of James Rattue’s contribution to the subject. His county guides for Kent, Buckinghamshire and Surrey set a high benchmark for such research – including my own – and his magnus opus – The Living Stream: holy wells in historical context (1995) is as it states in one of the intros to his work on the Living Stream ‘the most detailed and rigorous historical study of holy wells yet published in book format’. He was one of the main contributors to both the first or Old Series and New Series as well as the Living Spring Journal. The establishment of the old Source magazine in 1985 coincided providentially with my own discovery that there were such things as holy wells. At the distance of over thirty years I can’t now remember quite how I found out about it: I have a memory that I made contact with Mark Valentine about his monograph on Northamptonshire wells and he told me the magazine was about to emerge. What I do remember clearly is the excitement the first edition brought as it plopped through the letterbox, an experience repeated with every one of its eight successors spread over the following few years. There were never enough! And the very first article in that initial, blue-covered, number was Jeremy Harte’s survey of holy wells in my native Dorset. Could it be any better? Before Source my only guide to the sacred springs of my own county (and pretty much everywhere else) was, for all its shortcomings, RC Hope’s Legendary Lore of the Holy Wells of England. Bournemouth Central Library had a copy and as I turned its pages during one school summer holiday trying not to crumble the edges too much, I wondered how long it had been since anyone looked at it. Hope only lists six wells in Dorset, and of those, one site, the springs near Shaftesbury which were the subject of the annual Byzant ceremony, aren’t really holy wells of any description, while another, the supposed holy spring at Abbotsbury, doesn’t exist at all. Jeremy’s article in Source 1, however, introduced me to the fact that there were lots and lots of these places. I wanted to visit them, but it would take years before I managed to chase them down, and by then I would realise that even Jeremy’s list was inadequate and that there were over a hundred named springs (if not holy wells, exactly) in Dorset alone. The probable Holy Well of East Stoke I have only just visited, thirty-five years later; I now know that the time I spent uncovering the featureless spring I thought was the well in 1987 or so, sinking in bog over the top of my wellingtons and snagging my jumper on barbed wire, was wasted apart from using up some calories. I couldn’t have visited the Holy Well of Hazelbury Bryan: that was only dug out of the Dorset mud to celebrate the Millennium fifteen years after Jeremy wrote about it. My own contributions to Source first appeared in issue 5. Most of them were more detailed accounts of wells that Jeremy had mentioned, with the exception of St Andrew’s Well at Bradpole just north of Bridport, and the format of my pieces was heavily influenced by the way John Meyrick had laid out A Pilgrim’s Guide to the Holy Wells of Cornwall a little before, meticulously listing the date a site was visited and its map reference. That was all very well, but later on I began to deface the surface of holy well research, already far from pristine, with a variety of unwonted speculations. My article in Source 6 included ‘All Saints’ Well Hordle’ in Hampshire, presumed to be holy on the grounds of its proximity to an ancient church, a fact which at least I had the grace to admit. Issue 7 described ‘All Saints’ Well Thorney Hill’, a well in the grounds of a chapel I generously described as ‘no more than 250 years old’ (in fact it dates to 1906). It’s a nice feature but no one has ever treated it as a holy well of any kind. 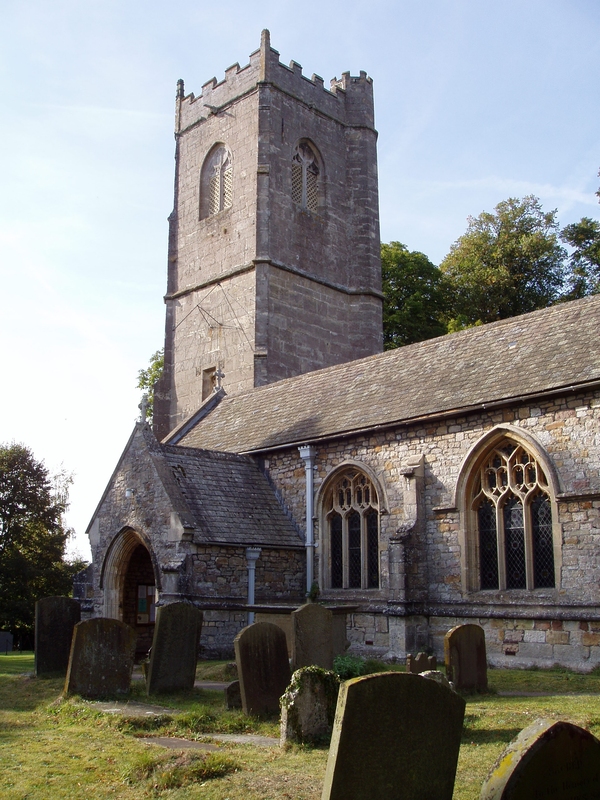 There was more wishful thinking in issue 8 when I wrote about ‘St Andrew’s Well Corton Denham’ in Somerset, another spring I’d given a sacred identity due to its being near a church. All these speculations resulted from me adopting completely uncritically the idea that pre-Reformation Christians had, wittingly or not, sited their places of worship on previously sacred locations which preserved an ancient awareness of the mystical power of the earth. I hope nobody now uses my descriptions of these ‘holy wells’ as evidence that they ever existed, at least not without heavy caveats! By the time Source re-emerged in 1994 under the editorship of Tristan Gray-Hulse it was as sceptical about these ideas as I had become. I now knew far more about the field of holy wells and therefore that it was beyond the scope of any small journal to list every one that might be found in a given area, and as if in sympathy, the new Source didn’t try to do this. Instead it concentrated on focused studies of particular sites or motifs that could illustrate wider themes. Tristan must have solicited a contribution from me before the first edition appeared as it carried a piece I’d written about the Holy Well of Frome, created by a Victorian Anglo-Catholic clergyman; it was followed by a short article on the folly-wells of Stourhead and one speculating on the origin of some wells dedicated to St Swithun in a Yorkshire dialect word meaning something completely different. These were all elements in the history of holy wells in which I’d become increasingly interested as I’d discovered that their story was much more complicated than I originally thought. No longer were holy wells merely taciturn, numinous features in the landscape: I understood more about them and how they had developed, their enormous diversity as well as the way they intersected with other features and historical themes. It was something of a necessary loss of innocence, I suppose, and Source had followed me in this, until its final appearance in 1998. But in the same way that coming across a really nice well that I’ve never seen before (even through the accounts of someone else) brings a sense of excitement, and re-visiting one of my favourite sites to see what mood it might be in carries a thrill of anticipation – because the well is continually changing – I will always remember with greatest affection the arrival of that first issue of Source, all those years ago.